Add all ingredients (minus the cucumber) to a food processor or high speed blender until smooth. Place hummus on sliced cucumbers, top with sliced tomatoes, serve and enjoy! 1. Add garlic clove to food processor. Blend until finely chopped. 2. Add in water, oil, avocado, herbs & onion and process, adding lemon juice and apple cider vinegar slowly stopping to taste. Add salt to taste. Place in serving bowl and surround with your favorite veggies, serve and enjoy! In a small mixing bowl, add goat cheese, herbs and salt. Mix well. Wash the mushrooms and pat dry. Remove stems and gills from the mushrooms. 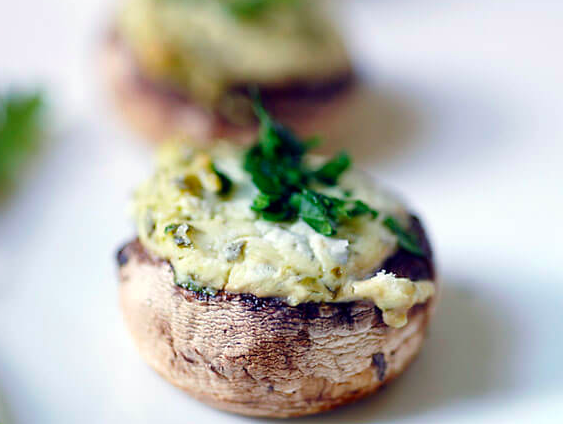 Scoop goat cheese mixture into mushroom caps, and place mushrooms on a parchment-lined baking sheet. Bake for 30 to 40 minutes, or until juices are seeping out of the mushrooms, and the goat cheese is crisp and golden brown on top. VOTE DR. Pauline Haugen BEST OF 425 & RECEIVE FREE TREATMENT!